Last week, I was chit-chatting with Emma. We were discussing different ways in which PT’s market themselves and how most of you focus entirely on online marketing. I then went on a bit of a rant and shared a direct mail method that PT’s could use to quickly win new clients and increase their income. Emma was that impressed that she asked me to write this week’s blog post for you. 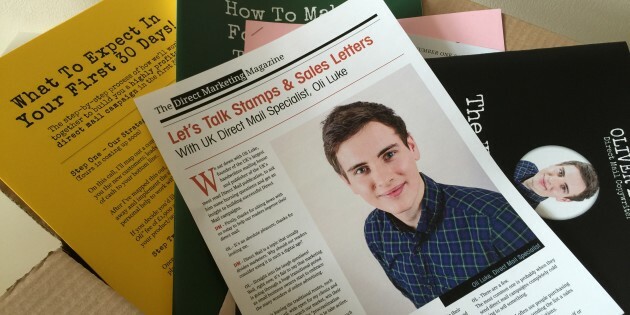 My name’s Oli Luke – I run the UK’s largest handwritten mailing house and consult with a handful of clients, helping them scale their direct mail campaigns … I also train/have a monthly printed newsletter and generally focus in the world of offline marketing. Now, let me just be clear here. I DON’T work in the fitness industry. Which means that I probably see things completely differently to you. If anything, I’m looking in from the outside – which allows me to understand the objections/concerns that hold most people back from hiring trainers … cause I’m one of those people. As a guy in average shape – I look at PT’s and the way they market themselves online and it makes me feel uncomfortable. Alpha-male’s that wake up at 5am, train, eat protein and argue with each other about the best “gain” methods. I really struggle to relate to it … and so do most of your market (in my opinion). So, I want to give you a direct mail method that you can use in your business that will allow you to address these issues. Well first, let’s break down your usual customer journey. I’m going to assume that you generate a lead and then you sell your Training/Bootcamp through a phone call or face-to-face meeting. Well, generally what happens with consultation calls/face-to-face meetings is that you organise a time and you spend a chunk of energy trying to persuade the prospect that they should dip their hand deep in their pocket and pay your fees. You have to justify the price, explain what results they can expect, prove your positioning … the lot. It makes your job both difficult and stressful. What if I could give you a direct mail method that did all of this for you … before you even spoke to the client? Now, I use this with a lot of my clients (non fitness industry) and it works amazingly … and I know that it would work for you as well. When you organise to speak/meet a prospect, ensure you organise it for 3-5 days into the future. It’s essentially a cardboard box. Inside the box, the prospect will find a range of documents. The aim of these documents is to pre-position and pre-sell your services. Testimonials/Case-Studies – this would show that you get results and that you have lots of social proof to prove it. “How To Hire You” guide – info of all prices, how working with you would work and what they can expect when they sign-up. This box would do all the “heavy-lifting” for you and ensure that the client is already sold on working with you when they show up. You just need to sign them up and take their first payment. Now, as far as I know, I have never seen a PT using anything like this before – but I reckon it would work brilliantly in your market. As we discussed, prospects in your market have a lot of objections before hiring a trainer – this box will not only address those worries but it will also set you apart from everyone. You just send them a box full of your documents and await the meeting/phone call. Not only will it increase the number of prospects that become clients, but it will also allow you to increase your fees and work with your dream clients. P.S – Thanks for reading, would you like a free copy of my £97.00 per month Direct Mail newsletter, digitally sent to your inbox? Thank you for the article. What do you think about providing these resources via an email document or document (s) as opposed to through the mail?